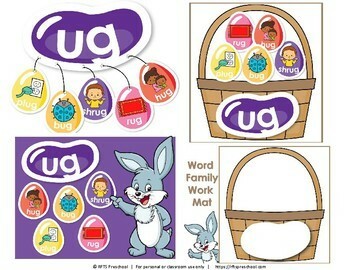 Your students will have fun as they sort out and match up word family groups. 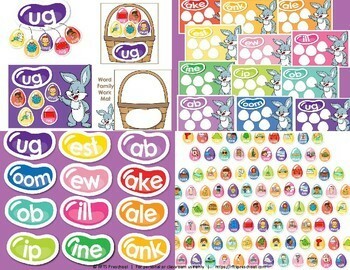 A fun Easter pack that includes a variety of learning activities when teaching word families. 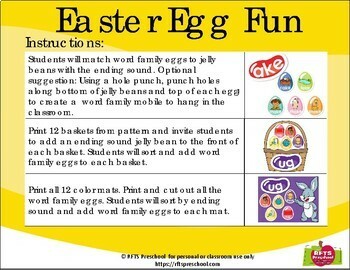 Students match word family Easter eggs to the jelly bean with the matching ending sound. This activity is perfect for adding some holiday fun to your learning environment. It’s a wonderful addition to your kindergarten classroom. Can be used to review or reinforce language in a variety of forms and ending sounds. It is the perfect addition to Literacy Center. -- UG - bug, hug, plug, rug, shrug. Check the preview to discover more details about this product. 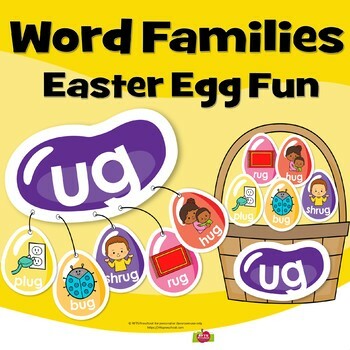 Keywords: Easter, word family, holiday, activities, printables, Easter eggs, jelly beans, basket pattern, enrichments, pre-k, kindergarten readiness, math centers, early math, childcare, RFTS Preschool, RFTS, RFTS Preschool, RFTS PreKindergarten, Robyn Birge, Reach for the Stars.